Marley Spoon offers fresh seasonal ingredients and wholesome recipes. Vegetarian boxes are available and that’s what I plumped for. I found the meals easy to prepare, despite them being a bit more elaborate than our normal weekday fare. Everything is already portioned up, so it’s just a case of chopping and cooking. The accompanying recipe cards are easy to follow with clear step by step instructions and have an enticing picture on the front, so you have an idea as to what you’re aiming at. My main difficulty was in deciding which Marley Spoon recipe to try first. 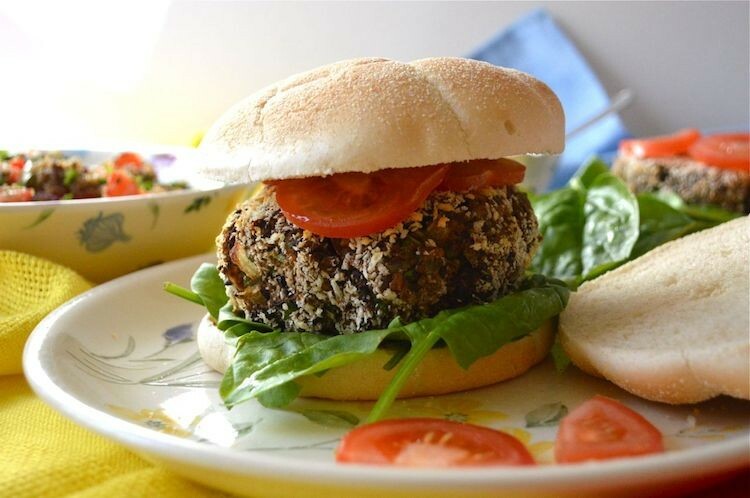 I chose the smoky black bean burger with lime & coriander quinoa. I was slightly daunted at taking on something I thought would be a bit fiddly; I needn’t have worried – supper was on the table in less time than it normally takes me to make something a lot more basic. Black beans are a favourite with us and CT is particularly keen on burgers, so this was a real winner. Baby spinach leaves were provided instead of lettuce to go in the burgers which made a nice change. I would have preferred wholemeal bread to the white baps we got, but that’s a minor niggle. I was particularly impressed with the packaging. The box that the food was delivered in was not covered in packing tape, as is so often the case, but was cardboard only, with neat tucking and folding to hold it all together. Insulating sheep’s wool lined the cool bag, rather than the usual plastic suspects. Moreover, there was little in the way of filling material either, yet everything arrived in good condition. Most of the items were in paper bags with only spillable/squashable foods and greens being wrapped in plastic. One of the things I really like about recipe boxes is that they can give me new ideas to expand my own repertoire. Crispy chickpeas and carrots is something I make quite often, but I’ve never thought to combine them with Swiss chard and tomatoes as in the Marley Spoon recipe, spelt & chard bowl with crispy chickpeas & carrots. My favourite meal was the mixed mushroom stir-fry with teriyaki tofu & soba noodles. It was rich with umami flavours and I adore shiitake mushrooms. The crunchy mangetout made a welcome contrast to the mushrooms and noodles, both in colour and texture. We ate this in a leisurely fashion with chopsticks, whilst CT reminisced about his trip to Japan. All in all, I was very pleased with the Marley Spoon recipe box. The meals were healthy, generous and well thought out and both CT and I really enjoyed them. The ingredients were all of good quality and the vegetables were fresh. There was a nice variety of recipes provided and two of them were completely vegan. The only dairy present in the third meal was a pot of yogurt, which if you were vegan you could replace or just not use. Unusually, there was no cheese at all! Don’t get me wrong, I adore cheese, but it’s good to have a break from it from time to time. A Marley Spoon recipe box with three meals for two costs £34.80 including delivery. Boxes for four people are also available as are options for two or four meals. Marley Spoon is kindly offering one lucky Tin and Thyme reader a three meal recipe box for two. The recipes and ingredients are likely to be different to the ones I received. To be in with a chance of winning, please fill in the Gleam widget below. You will need to leave a comment on this post, answering the question, which then gives you additional chances to enter if you so wish. Gleam will pick a winner at random from the entries received. If you are commenting anonymously, please give me some way of identifying you as I will be verifying the validity of entries. Any automated entries will be disqualified. This giveaway is only open to those with a UK mainland address. Winners will need to respond within 5 days of being contacted. Failure to do this may result in another winner being picked. Please note: Although Marley Spoon deliver to most locations in the UK, some remoter areas may not be covered. You might want to check they deliver to you before entering the giveaway to avoid any disappointment. There is no cash alternative. Prizes are offered and provided by Marley Spoon and Tin and Thyme accepts no responsibility for the acts or defaults of said third party. Tin and Thyme reserves the right to cancel or amend the giveaway and these terms and conditions without notice. Do take a look at the giveaways page to see if there’s anything else you’d like to enter. You can also find other competitions at The Prize Finder. These boxes sound a great idea as they have all the ingredients required to make up your chosen meal. They would tempt me into trying something a little different too! It sounds like a lovely idea and I would love to try the recipes. im good at cooking and like to experiment, but i only experiment with ingredients i know, so would expand my cooking skills, and good excuse to eat something tasty! We love cooking and these would be an easy way to try something a bit different for a change! I’m a passionate foodie who is always looking for something new and exciting to try. I love to share my opinions with fellow bloggers and readers. Love trying new things in the kitchen but I have a baby so a bit stuck in a rut as just go for the easy meals. Yes, I was really impressed by the vegetarian meals being vegan Natalie – very inclusive and something most people would enjoy I reckon. Oh all of this looks lovely, I bet the chard worked really well with the chickpeas and carrots? It’s always good to get new ideas for meals! It was a good combination Sus and it felt a bit more special than our average evening meal. These boxes sound lovely. I feel that we are stuck in a food rut at the moment and would love to try out some new ideas. This would really break me out of my regular boring meal routine. These sound a great idea – I’m always looking for inspiration! I tend to stick to the same meals each week and it would be nice to experiment without worrying if I’ve got all the ingredients. I would love to win to cook up some lovely home made meals! They look good! I like that you get to try meals that you wouldn’t normally consider making. Mmm it’s food whats not to like?! I’d like to win as I’m not very inventive in the kitchen, so need a bit of help and inspiration. I love trying new recipes and seasonal ingredients and this would help me come up with new dinner ideas!! I would like to win this as I am always on the look out for new food to try and new recipes this would be great. A great healthy box of food. Because I’m always on the lookout for new inspiring and healthy veggie recipes! because i love cooking and want to try this! I’ve never tried a recipe/good box before and would love to! to experiment more and to give me cooking inspiration! Would love to try and cook something new! I love trying new recipes, and need some more inspiration for wholesome home cooked foods!! Because they look tasty, healthy & easy to do. It would give me some more cooking ideas and you have all the ingredients in it to make a lovely meal! I’m sick of eating the same food! Need new ideas. Because I would like to treat my husband and I by trying things we wouldn’t normally have, I love the idea that the ingredients are split exactly for what you need! No waste then. My partner does all the cooking, and sometimes we run out of ideas for what we would like. This sounds a good way to try something new without having to think about shopping. These sound just what Im looking for. Would be wonderful to try them and would be a wonderful surprise for my family. This sounds perfect. I’m always planning nice meals only to forget one important ingredient or another – this would definately prevent that. Oops Jo! But so easily done. I’m lost when it comes to trying new food! I think the idea of pre-planned meal boxes with fresh ingredients is great!!! We tend to eat the same things every day, a bit of variety would be nice. When I ask my family what they fancy they just say I don’t know! We love cooking and I love the idea of trying new recipes. Would love to try as I get bored with food and need inspiring, would be nice to have something new to try. We’re keen cooks but always end up making variations on the same sorts of meals – would love to get new inspiration! Yes Emily, the boxes are just fab for that. As a family we have switched to vegetarian cooking a few months ago so I need inspiration for new meals to try. I love the fact that vegetarian boxes are available. Thanks for entering Nora and good luck. I do hope you take a look at some of the recipes on Tin and Thyme – you never know, you might find something to inspire. Love to win to discover more recipes and enjoy cooking special and healthier meals for my family. Also great to stop wasting food which goes out of date often in the fridge. I really enjoy cooking but sometimes you do get in a rut and need some fresh inspiration which this would definitely provide, especially if it all arrives ready for you to get going. As a mainly vegetarian household, it’s also great that something like this exists for us! I would love to be able to cook my hubby a more adventurous meal and these sound so easy to make. I enjoy trying new recipes but quite often they call for ingredients that I don’t have to hand, or aren’t easily available – I like the idea of having a tried and tested recipe with all the necessary ingredients provided for you. Particularly impressed that they have vegan options. Yes, it’s really annoying when you’re following a recipe and find you don’t have everything that’s required. The only thing you have to worry about here with these is olive oil, salt and pepper. I love trying new things and I’m all up for new recipe ideas! It would be nice to have a rest from planning a meal and these look nice and healthy too. These look nutritious and filling. I like to keep cooking as easy as possible after a long shift. TO give me some meal inspiration and some new heathy ideas. I love experimenting with food! We love experimenting with all sorts of ingredients (especially since we’re trying to lose weight and not just eat like rabbits) so this seems like an excellent idea to rejig recipes! Having everything weighed out & all ingredients in one place really appeals as I usually plan a recipe then find out I’m missing an ingredient! I love a surprise and you get one with a Marley box. I’m not a vegetarian, but it would be nice to try some new meat free cuisine. I love trying out new recipes,but often find I am missing one ingredient. Marley Spoon would overcome this problem..
I’m bored with our usual repertoire of recipes and need some new ideas. This would be a great way to do that. I always eat the same things and would like to try something new. To get my children to try new foods and cook it themselves. We end up making the same food all of the time, I’d love some inspiration. This looks fab! I’m always after trying new thing, it gets so dull cooking the same old every week! It would be wonderful to win this as I would love to make some new recipes! Feeling bored with food of late! Ah, we all do it Emma, some days you just need something quickly. Good luck. I love cooking from scratch for the family , this would be ideal for us. I would like to win this because I’m always struggling to think of things to cook so this would help and inspire me. I’d love to win this because I have zero imagination in the kitchen. I am always cooking the same old things and struggle with ideas on how to mix things up a bit. I would like to win as I always like trying new recipes. I would love to try some new meals, we always make the same! I love the idea of a pretty planned meal plan plus I can’t forget to buy any of the ingredients!! I need some new ideas to brighten my diet. I’ve searched for the ‘recipe’ for success, day and night, the answer to my prayers would be this box of delight! They look delicious. Quick and easy for convenience. Really pleased they do veggie too. Would love to win this as loving trying out different recipes. Love trying out new recipes for dinner – doesn’t always get the familys’ approval! They sound nice as we work full time nights and eat a lot of premade food. I don’t eat many new dishes and I would like to try some new recipes! The food looks delicious and as I vegetarian I would love to try some different recipes to add to my usual go to meals. I love these kind of almost ready made meal kits, so much easier! I would love to give this recipe box as try as it seems like a really convenient way to try new recipes. I’d like to try something completely different and expand my family’s tastes! We are a foodie family who love experimenting with new nutritional ideas and recipes. I always love trying new recipes. You can never have too many waiting! I like trying new things & these look amazing to eat. We love cooking! Be great to have a change. I would love to win this great prize for lots of new ideas on what to cook. I’d like to win, as always up for trying new things & this looks ace! I have never tried them and I would like to, please. Great idea – would love to try them out it would greatly improve culinary skills. I’ve been looking into a few different recipe boxes trying to decide – I’d love to try this to see if it’s the one for me! I would like to win a Marley Spoon recipe box so I that I make some delicious food. I desperately need some cooking inspiration to get me out of a rut! wow, what a good idea, make life much easier, would be a nice treat for a weekend chilling. I’d love to win as it would challenge me to learn some new healthy recipes! I like to try all things new. It’s a great way to try something new. love to win as son loves to experiment with cooking. I would love to win for healthy Yumminess and great cooking MAGIC. Well done Paula. 32 years of not enjoying cooking is an awfully long time. I would love to try some new recipes for me and my best friend. Thanks for the chance. I would love to win as I’m not very good at cooking and this seems like a great way to make some tasty meals. My partner would enjoy the break from cooking too! I love trying new and different recipes and foods. Would love to win this as I really need some new meal ideas that stop me resorting to unhealthy takeaways! I work 5am-2pm every day, so I frequently lack motivation to go and buy ingredients for fresh meals. This would be so handy, I really love to cook! Because I enjoy cooking and trying new foods but I sometimes lack inspiration. would be fantastic to try out for myself. We often get stuck trying to think up something tasty for dinner so this would help us out! Love the idea of someone else designing a meal plan, takes all the hassle out of grocery shopping! « Previous post link Tahini Sauce with Clementines, Smoked Paprika and Pizazz!